Anyone who has walked the path between the Post Learning Commons and the Science Center at Saint Joseph’s has likely noticed signs that indicate the latter’s “green roof.” But what really goes on up there? 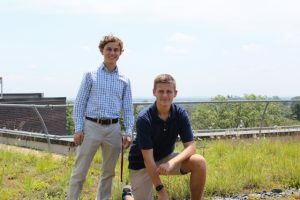 Martin Ryan ’19 and Connor Long ’19 are exploring the answers as part of a project for the Summer Scholars Program. Together, they are analyzing the microbes in the soil of the green roof in search of bacteria and to discover the types of carbon sources they use. Long and Ryan collect soil from different areas on the green roof using a soil core sampler and then place the soil into a 50ml tube and fill it with water. After creating a dilution, they place the liquid onto an agar plate — a Petri dish that contains a growth medium — to count the colonies of bacteria within the soil. Finally, they use a pipette to place the solution into a Biolog “EcoPlates.” This tool has 96 wells, with three replicas of 31 different carbon sources and three wells filled with water that serve as the control. Long and Ryan use this to detect carbon: if the carbon solution turns purple upon contact with the soil solution, the bacteria in the solution is using that specific carbon source. Their mentor for this research is Karen Snetselaar, Ph.D., graduate director and professor of biology, who has research experience in urban ecology. She has previously mentored students through the Summer Scholars Program on the green roof, and says that Long and Martin’s research has practical value for those who want to start green roofs in the Mid-Atlantic states. By examining the four types of soil plots on the roof, the two scholars’ ultimate goals are to discover a difference between carbon sources, draining systems and whether there are dry or wet spots. Both students sought places in the Summer Scholars Program to engage in independent research and to discern their career paths, which include either research or medical school. To Ryan, Summer Scholars provided a chance to set himself apart from the rest of his classmates and to answer his own scientific questions. Snetselaar enjoys working with both of the students, who each took a course in environmental microbiology, initially sparking their interest. Outside the research lab, Ryan is on the SJU Gaelic Football Club team and plays in intramural sports. He is also a member of Sigma Zeta Honors Society and Alpha Epsilon Delta Honors Society. Long also plays intramural sports and is involved in Sigma Zeta. Both students are on the Dean’s List. It’s a game of inches. The adage has been applied to sports for decades, and it’s true: contests across the globe are decided by a small margin every day. In fact, dozens of math concepts can be applied to any given moment in a sporting event. Lauren Hall ’19 is hoping to use this to her advantage in developing an engaging math curriculum for high school students and college freshmen. 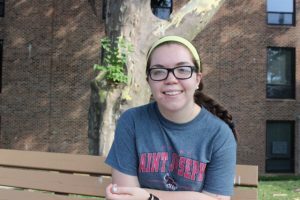 Hall, a dual mathematics and secondary educations major from Malvern, Pennsylvania, is taking on the project as part of SJU’s Summer Scholars Program. Under the mentorship of Tetyana Berezovski, Ph.D., associate professor of mathematics and director of the graduate program in secondary mathematics education, Hall is designing a challenging lesson plan based on the mathematics of volleyball. 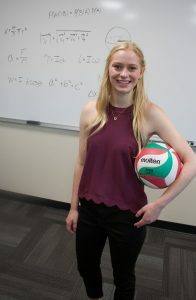 A member of SJU’s women’s club volleyball team, Hall hopes connecting the sport to math will help students to more readily understand concepts. “I believe that an interesting, comprehensive and challenging curriculum is paramount to better engaging and enriching students as they progress with mathematics,” she says. Hall has earned a place on the Dean’s List in each of her semesters at Saint Joseph’s. Outside the classroom, she serves as a resident assistant and is a member of Sigma Zeta, the national Science and Mathematics Honor Society. She says that the Summer Scholars Program allows her to work at her own pace. When some of us hear a particular piano piece, even one from the great composers, observations might end with, “Oh, that sounds nice.” Seldom are we able to recall why we liked or disliked what we did. 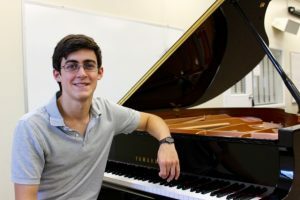 Yet to Austin Sbarra ’18, a music and communications studies double major, a piano piece isn’t just a series of sounds; it’s a challenge, a dare to uncover the elements that produced them and a chance to create something new. For the SJU Summer Scholar’s program, Sbarra is engaged in a project that revolves around Beethoven’s Sonata No. 8, Op. 13, or “Pathetique.” His goal is to analyze the harmonic and formal structures in the composition to then create a new piece using those elements, while incorporating his own musical interest and influences, mainly jazz artists like Bill Evans. Sbarra is working under the guidance of Suzanne Sorkin, Ph.D. chair and associate professor of music, theater and film. Sbarra, from Bel Air, Maryland, is currently analyzing the introduction and exposition sections of the first movement, which is in a sonata form. He is also currently in the precompositional phase, which involves developing 3 motives, similar to those of Beethoven, for his own composition. Sbarra is involved in the SJU jazz band as lead pianist and occasional alto saxophonist, where he is also the president. He holds a student work study position for the Department of Music, Theater and Film and SJU’s Department of Athletic Communications. Additionally, he is a teaching assistant for Sorkin and a Residential Assistant. Are you a poet? If you haven’t met Emma Seely ’18, it’s possible that you are and you just haven’t discovered your inner bard yet. As part of a project for the Summer Scholars Program, Seely, a dual English and psychology major from Parkton, Maryland, is building a collection of poems written by people she meets on the streets of Philadelphia. Seely guides the writing by asking the poets to think about an object, then gives them several prompts to describe the object: its appearance, how it affects the world, and so on. Each exercise lasts 30 seconds; within five minutes, a new poem is born. She publishes the finished products online at https://poemsofphiladelphia.wordpress.com. A longtime fan of the art form, Seely hopes that the projects kick starts a love of poetry in both her spontaneous authors and those who visit the site. Seely’s mentor, Thomas Coyne, M.F.A., assistant professor of English, agrees about the project’s potential to inspire a love of poetry. 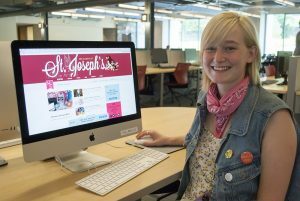 When not working on her Summer Scholars project, Seely is a member of three national honor societes: Sigma Tau Delta (English), Psi Chi (psychology) and Alpha Sigma Nu (Jesuit). 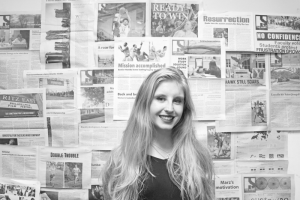 She participates in weekly service at Covenant House, hosts a radio show on Radio 1851, volunteers in a campus psychology lab and mentors students at SJU’s Writing Center. Seely says that the hopes the project brings her to a better understanding of the world around her. Follow @sjuartssciences & @haubschool on Twitter to learn about this year’s Summer Scholars. It’s important in college for students to find a place where they can escape and focus. For many, it’s a quiet corner in the library or a residence hall lounge late at night. For Marisa Egan ’18, it seems that the best place to go after a long day of classwork is the lab. 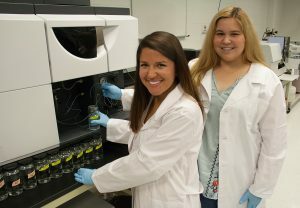 The junior biology major, mathematics, philosophy and chemistry minor and McNulty Scholar has spent a considerable amount of time during her two years on campus — and two full summers as part of the Summer Scholars Program — in the lab of Shantanu Bhatt, Ph.D., assistant professor of biology, conducting research on the pathogenic bacterium Escherichia albertii. The bacterium, which is in the same family as E. coli, attacks the intestines, causing diarrheal problems. It is drug resistant, has no vaccine, and largely affects infants in developing countries, though some cases have appeared in adults in Japan and Germany. 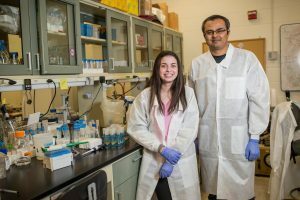 In the summer between her freshman and sophomore years, Egan and Dr. Bhatt became the first research team to successfully create such a mutation in the bacterium since it was identified 25 years ago. Their research was published this year in Biological Procedures Online. Egan was the lead author. Another paper, led by Dr. Bhatt and co-authored by Egan and other researchers, was recently published in Gene & Translational Bioinformatics. Egan enjoys the abundance of time that comes with doing her research as part of the Summer Scholars Program. Egan credits her parents — both of whom are doctors — with teaching her a love of science. Outside the lab, Egan mentors her fellow students by serving in SJU’s Success Center as a supplemental instructor for Biology 101 and teacher’s assistant for organic chemistry lab courses. She is also the scholarship chair for Pi Sigma Phi, a gender-inclusive academic honors fraternity on campus. Imagine yourself sitting at a table, ready to eat lunch. You pick up your sandwich, take a bite, and find that there’s a long hair protruding from between your lettuce and cheese. How do you react? Be careful how you answer; it may determine how desirable you are. Kristen Lanzilotta ’17, a psychology major and Summer Scholar, is researching how women’s reactions to disgusting situations affect how they are seen in others’ eyes. 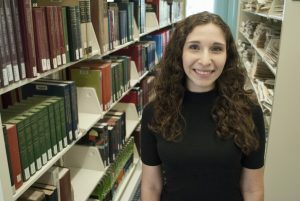 Under the mentorship of Alex Skolnick, Ph.D., assistant professor of psychology — an expert in the emotions of disgust — Lanzilotta is spending the summer conducting surveys, asking participants how they’d feel about a woman who reacted to a disgusting situation in a variety of ways. Summer Scholars was a natural choice for the project, Lanzilotta says, because it gives her the time and space to find her research style. 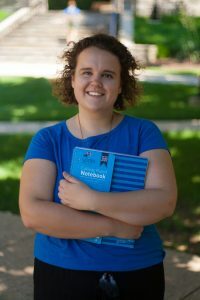 Lanzilotta is a regular presence on the College of Arts and Sciences Dean’s List, and is a member of the National Society of Collegiate Scholars and Psi Chi Psychology Honor Society. Outside the classroom, she competes in intramural soccer. Summer Scholars Project: Women who do not say “Yuck!” Are Women Evaluated Differently Based on their Response to a Disgusting Situation? Millennials are lazy. They’re entitled. They’re narcissistic. At least, that’s what other generations say about them. But what if you give them a chance to speak for themselves? Christaldi draws inspiration from “Slouching Towards Bethlehem,” an influential collection of essays about life in California in the 1960s by Joan Didon. She discovered the book in a class taught by Owen Gilman, Ph.D., professor of English. Dr. Gilman now serves as Christaldi’s mentor for the project. “Dr. Gilman’s course ‘Rereading the ‘60s’ exposed me to new types of writing, and his knowledge of that type of literature made him a perfect fit to oversee my project,” she says. During the academic year, Christaldi is a tutor at the Writing Center and managing editor of The Hawk student newspaper. She is also a member of the Women’s Leadership Initiative and a student board member of SJU’s Women’s Center. She has made the dean’s list, studies in the Honors Program, and has been inducted into the Sigma Tau Delta English International Honor Society.